I want to be more specific in this topic and I want to talk about watching movies in the movie theater. I’ve been wanting to write a post about this since forever but I kept putting it on hold until last Sunday because it happened again. If there is one thing that my hubby and I have in common, that is watching movies whether at home or in cinemas. There are few things that I missed back home and one example is that, we can pick and choose what snacks or food we can bring inside while we enjoy the show (I hope that hasn’t changed yet since I haven’t been home for two years now), while here you are only allowed to bring food that you can buy on the concession stand (which is very limited and expensive too😁) secondly, we can watch the movie over and over again if you feel like it (ex. you went in and watched the first show of the day and you wanted to stay until the 2nd, 3rd or even stay inside the entire day and it’s still OK). Now, you might be wondering where I’m heading with this post and to be more detailed, this is what I want to share. I hope the photo is visible enough for you to see what I’m trying to convey. the show, “please silence your cellphones 📱now” but it seemed like they are not too concerned about one thing and that is “other people’s feet or shoes on someone else’s face🙈”. When we used to live in Florida, they are strict and their ushers will really come to you and make sure that those stinky🙊feet are down. Back home, they do the same thing and they also have a sign below the screen “Feet Off the Chair“. You might think that this gets annoying but actually it’s not. They aren’t visible the entire time, they turn it on and turned it back off just to remind the people to keep those feet down. I was really biting my tongue to tell the guy to put those feet down but I didn’t want to create drama. You never know! some people take it nicely, while some takes them ugghhh..😁 let’s not even go there (you know what I mean). 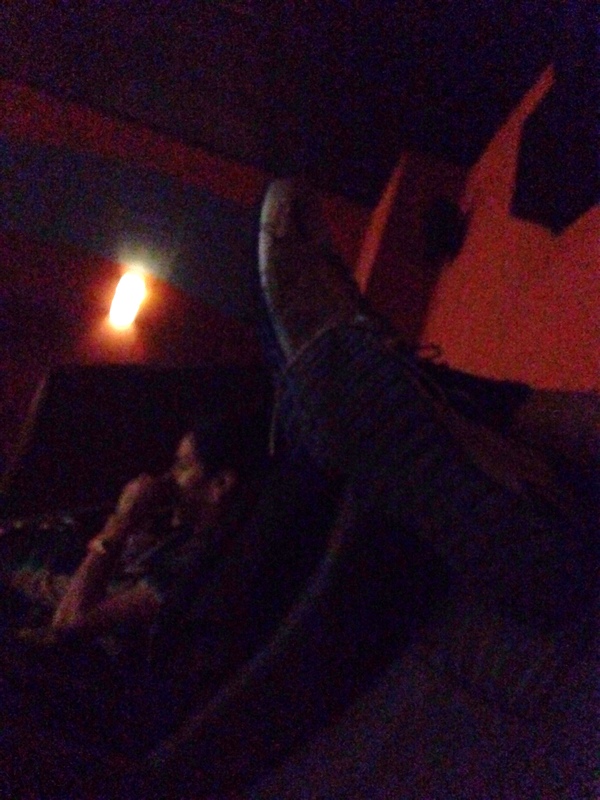 Gladly there was one vacant seat beside me before his foot get stuck on my face (hahahha😝) but I still was annoyed the whole time just because of the fact that the cinema usher just kept passing by and didn’t even bother to get his attention. Immediately after the movie, I right away went straight to the Customer Service Desk and asked for the Manager. I spoke with the manager and explained what happened. Gosh!!! He didn’t look surprise and said that as long as the person didn’t bother me or someone then it’s acceptable. Waahhh what kind??? He even said that if we don’t want to approach the person then we can come to the customer service desk and inform them and they will do their part! WHAATT? ?😱 Does that mean I will miss part of the show just for that?? UUggghh you really can’t have everything right? Anyway, I’m sure the rules are different everywhere but I just wish that one day this will be a universal policy. But yeah, that jerk with the feet on the chair is rude, and the manager didn’t do his job properly. That’s nice and yeah!! I was surprised that this is their policy.. And even the girl beside my hubby put her feet on the chair infront of her too..though no one is there but still! The dirt and all from the shoes goes to the chair and bottomline rude!